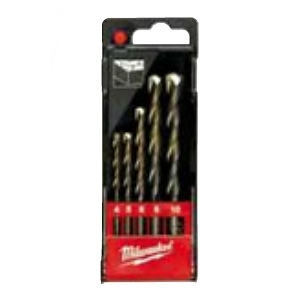 5 piece concrete drill bit set, round shank, in plastic cassette (Ø 4 / 5 / 6 / 8 / 10 mm). Diamond ground percussion carbide tip with two cutting edges. For drilling in brick, tile, ceramic, concrete, plaster, slate and aerated concrete blocks.